Small cakes can be very festive. Small cakes offer plenty of advantages over large wedding cakes. While some couples prefer giant, elaborate cakes for their reception dessert smaller cakes can be just as flavorful and elegant. Some reasons a couple opts for small cakes for their wedding reception are practical and economical considerations. 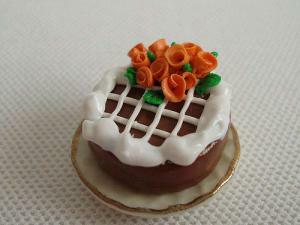 Small cakes are beautiful and elegant. With the right presentation, they make brilliant showpieces and can shine at a wedding of any size. Although it's the norm to see gigantic cakes at weddings, there are many reasons to choose a smaller dessert. Wedding Size: For intimate celebrations, there's no reason to display a huge cake, and guests likely aren't expecting an elaborate dessert presentation. Economy: Smaller cakes are cheaper than bigger models because they feed fewer people. In some cases, couples can save hundreds of dollars by going with a cake that's just a bit smaller than the size for which they had originally planned. Practicality: Many wedding guests are too stuffed after hors d'oeuvres and generous dinners to even try dessert. Others are content to share their portions with their companions. Thus, couples who serve huge wedding cakes often end up with equally large portions of leftovers, and offering a small wedding cake solves that problem. Variety: A cake doesn't have to be the only dessert at a wedding. Couples who want to offer some variety and include pastries, cupcakes, éclairs, or other sweet options might pick a small cake to include along with a dessert bar. Decorations: It's not uncommon for intricate decorations or details to be lost or dwarfed within very large wedding cakes. A small cake offers the opportunity to showcase all types of decorations and gives them the attention they deserve. Brides or grooms who enjoy baking but are intimidated by the prospect of designing, creating, and assembling a large or multi-level cake might not feel so overwhelmed by baking and decorating a smaller dessert. Making your own wedding cake isn't a common choice, but it's a wonderful way to save money and get exactly what you want in a dessert without leaving all the details in the hands of a decorator. The definition of "small" varies from person to person, with most small cakes having between a single tier and three small tiers, so it's within the reach of even beginning decorators to create with a bit of practice and dedication. Making your own wedding cake also opens up the possibilities of having exotic flavor and color combinations that some decorators might be hesitant to do. If you're willing to take the plunge, experiment with cake flavors and textures in advance, order any specialty supplies you need, and prepare and freeze the cake layers a day or two in advance of the wedding so that you have plenty of time to decorate and assemble your cake (with time to spare in case something goes wrong). Small cakes don't hog the spotlight at a wedding reception; instead, they're beautiful and understated. Still, a little cake can look miniscule when it's set all alone in the middle of a giant table, so be mindful of your display. Scattering rose petals or fresh flowers around the cake is one great idea that will infuse the surrounding air with a nice floral scent. 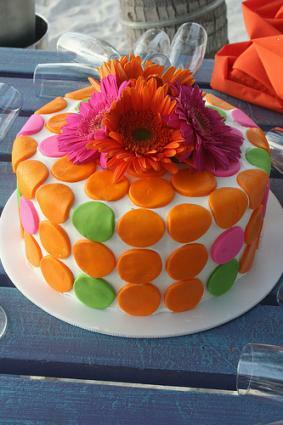 Using a small table or pedestal for the cake also works well. Try setting your cake in the middle of a wedding dessert bar and surrounding it with cupcakes or pastries in a decorative pattern. Don't worry about drawing too much attention to your small cake. If it tastes as good as it looks, everyone will give it the focus it deserves when dessert time arrives.